The Bard of Bundoran drops by for a tune at the Cliffoney Rambling House. The traditional music played today in Ireland is one of the most wonderful aspects of our muddled culture remaining to us. The story of traditional Irish music is as interesting as any other aspect of Irish culture. 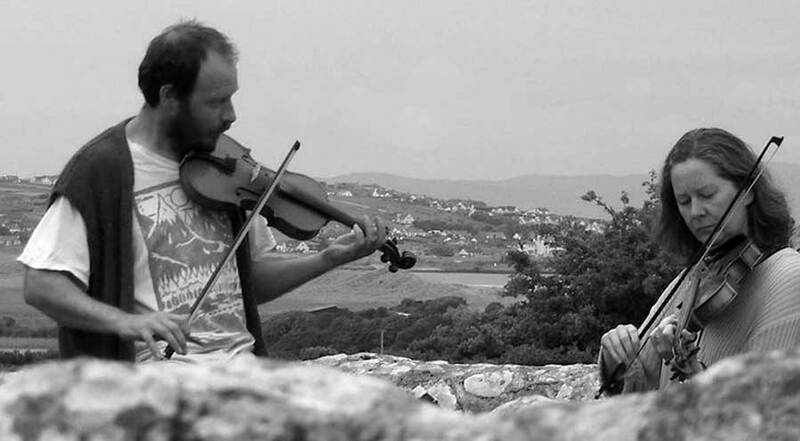 There is a long tradition of music and melody coming from the landscape of Ireland. Music is featured throughout Irish mythology, for example when the harper Corann, a musician to the Dagda at Newgrange, puts the rampaging sow Cail Cheis to sleep with his enchanting music; this magical musical energy spills out from the caves in the mountain of Kesh Corann in County Sligo. This raw enegry is perfectly captured by the Bothy Band on the Kesh jig set at the start of their first album. The Bothy Band play the Kesh set from their first album, 1975. Hearing the Bothy Band inspired me to give the fiddle a try; I brought one in Grehan's of Boyle not long before the shop closed, and enrolled in the Drumshanbo school of music. Now I play fiddle, banjo, and a fabulous set of uilleann pipes made by Limerick musician Mickey Dunne. 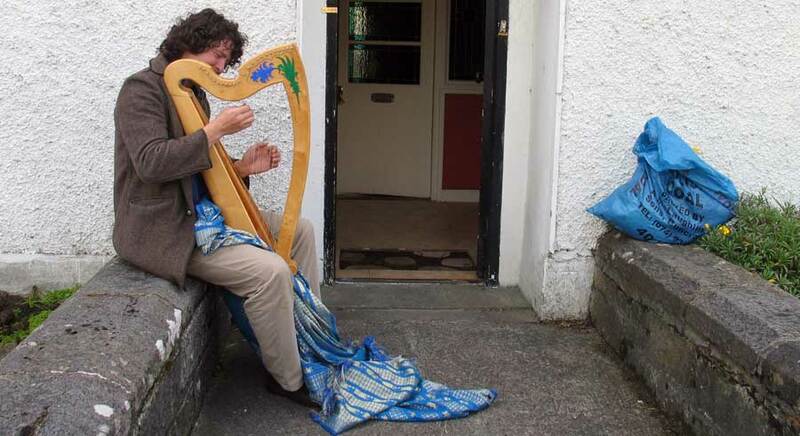 Paul Dooley playing his own handmade clairseach, the original Irish harp, with a willow frame and wire strings. The harp is the symbol of Ireland, and is frequently mentioned in Irish mythology. Older tunes tend to be simpler, such as some of the medieval marches like O'Moores March and Brian Boru's march. The Irish clarseach is much different to the modern Celtic harp - smaller, and so much more portable, wire strung and played with the nails, which must be kept long and strong, and no levers to change key. James Scott Skinner, Scottish fiddle virtuoso and composer 1843 - 1927. The fiddle was the most popular instrument in the south Sligo area surrounding Carrowkeel. Three of the best known Irish fiddlers from the 78 era came from the area around Ballymote - Michael Coleman, James Morrison and Paddy Killoran. All were in some way influenced by the playing of Scottish fiddle virtuoso James Scott Skinner, the Strathspey King, a prolific composer. Michael Coleman 1891 - 1945. Michael Coleman, from Killavil near Gurteen in south County Sligo, emigrated to New York at a young age. He quickly found work on the vaudeville circuit, where he danced and played the fiddle at the same time. John Doherty, a travelling musician from County Donegal was another amazing Irish fiddler. Also heavily influenced by Skinner, he had a huge repertoire of tunes of all kinds, including many Scottish tunes. John was a tin smith by trade, and travelled all over Donegal plying his trade and entertaining the people with his masterful playing. Felix Doran, the amazing uilleann piper, younger brother of Johnny Doran. Singer, whistler, uilleann piper and music collector, Séamus Ennis. Playing the fiddle at Creevykeel in County Sligo.